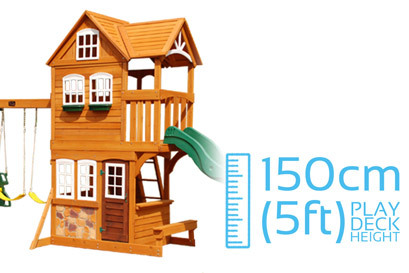 Kids love to play, and they enjoy nothing more than imitating mum and dad, so having their own little house is amazingly fun feature! Especially when their playhouse has it's own entrance, windows and a serving counter so they can serve their friends and siblings with tea, sandwiches and ice cream! 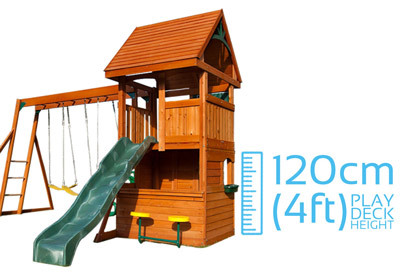 The Playhouse Package is an add-on kit which can be attached to any Selwood Climbing Frame Fort. The package comes flat packed and easily mounts to the existing fort structure, replacing the sandpit area. The entrance on the Selwood Playhouse is open to enable children to easily enter and exit. There's no door, so there's nothing to impede them entering and leaving whenever they like. Our playhouses include a serving counter across the front of the fort. This enables several children to sit or stand either side of the counter to interact with others. Two stools are also included.